ChocO Lot Ahh…the chocolate that loves you back! Do not be fooled by imitations, you can only find this incredible formula here! Mother nature lends her finest ingredients to promote alertness and energy while calming you for a focusing effect that will lift your spirits and brighten your day. No jitters, no crash afterwards, no addictive chemicals or harmful additives. It gets better, all this comes in a rich chocolate elixir to satisfy cravings while treating your body to the best. What is Choc O Lot Ahh…? It's a rich chocolate elixir: a natural supplement enrobed in decadent chocolate. It is specifically designed to target the pleasure center of your brain. Portable! It fits in your purse for a fix on the run. Formulated by a master herbalist to both perk you up and calm you down. The first chocolate to truly love you back! A dropper of this liquid gold gives you a rich chocolate burst that will satisfy the deepest cravings, but that is just the surface. This chocolate contains a blend of incredible ingredients with amazing properties. The combination works naturally with your brain chemistry to both energize and calm you. That’s where the “Ahh…” comes in. When you feel stressed or frazzled, dragging or a little fuzzy, a simple dropper of chocolate will help lift and focus you. The only supplement formulated to target the pineal center of the brain…this is feel-good chocolate! What is in this stuff that makes it so amazing? Choc O Lot Ahh… is unlike anything else on the market today. It is designed to have immediate effects, however you will notice these effects get better and better with prolonged use. How does it do what it does and what makes it so different from other energy supplements? First, know that each ingredient is deliberately chosen for its naturally rejuvenating characteristics and are carefully selected to assure the highest qualityavailable. To preserve potency and purity, Golden Herbs utilizes a unique and revolutionary process of extracting and concentrating herbs that retains their natural properties and delivers the finest finished product available. 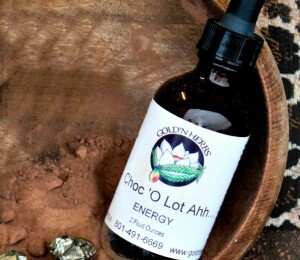 Choc O Lot Ahh… features an all star cast of power packed, natural ingredients. Ingredients: Kosher Vegetable Glycerin, Gold Water, Organic Honey, Gold Water, Cacao, Green Arabica Bean, Vanilla Bean, Velvet Bean (Mucana), Capsicum, Indium and Proprietary Blend of Mineral Salts. used as the base for the liquid because it is naturally sweet while remaining low calorie and safe for diabetics. Whereas most herbal extracts contain alcohol, the solvency action of vegetable glycerin aids in extracting botanical properties from plant materials without the use of harsh substances. This is truly one of the “magic” ingredients and unlike anything available anywhere else. Gold promotes an overall feeling of euphoria while helping the body to relax. It enhances the body’s natural defenses against illness and promotes vitality and longevity. It raises energy levels, increases glandular function and has anti-inflammatory effects. Gold is known to restore well-being with its tremendous balancing and harmonizing effect on both physical and emotional states. Gold is also thought to have a direct effect on the rhythmic, balancing, and healing activity of the heart and for improving blood circulation and rejuvenating sluggish organs, especially the brain. Gold can facilitate detoxification on a cellular level which not only prevents illness, but allows the organs in the body, particularly the brain, to function clearer. Gold can even improve memory function! Gold is an activator, meaning it amplifies the properties of the ingredients it is combined with. This is why a small dose of Choc O Lot Ahh… has such an immediate effect. The Gold included in Choc O Lot Ahh… is unique because it is in a crystalline form: measured in nanometers, the smallest measurable particles! Purer than its metallic form, crystalline gold is immediately absorbed and, because it passes through the cell membranes so easily, has zero incident of toxicity. The natural bean that is processed into our beloved chocolate. Cacao has impressive nutritional and healing properties. Chocolate and cocoa contain a high level of flavonoids, specifically epicatechin, which may have cardiovascular benefits including lower blood pressure and increased circulation. Cacao contains a wide array of trace minerals and vitamins. It may increase your focus and alertness and contains nutrients to keep you happy. 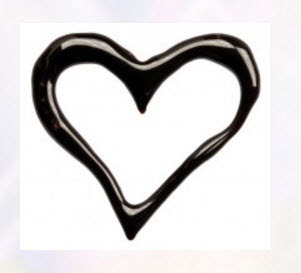 There is a reason chocolate and cacao are so often associated with love. All this is due to the feel-good properties cacao possesses. For example, Anandamide is produced in the brain when we are feeling great and cacao makes the effects of anandamide last longer. Cacao also contains theobromine, a stimulant that lifts mood and energy levels. Cacao, and therefore chocolate, is also famous for promoting the release of serotonin (a brain chemical related to a positive sense of well-being). Our cacao is imported from Brazil and processed with the utmost care to preserve these exciting qualities and provide a deep chocolate flavor. A vine that grows long thin “hairy” pods, the beans have an impressive list of health benefits including: improved mood and energy, enhancing libido and sexual capacity, optimizing testosterone production, treating insomnia and generally deepening sleep. Mucana is used by people suffering from depression-related illness, since these people have deficiencies of the neurotransmitters serotonin and dopamine which the velvet beans contain and help balance in the human body. Mucana is well documented to increase dopamine, the pleasure hormone that makes you feel good, stimulates you, motivates you, and helps you cope with stress. Supplementing dopamine can greatly affect your quality of life, by increasing your overall energy levels, lifting your mood, and creating a feeling of mental clarity that increases decision-making, creativity, motor skills, and even attention span. Higher levels of dopamine also stimulate production of other beneficial hormones, like testosterone (mucana has a balancing effect and will not create an overabundance of such hormones) and so has youthful benefits such as increased libido and performance. As an added bonus, people taking this incredible herb have reported deeper sleep with enhanced lucid dreaming effects. Vanilla is usually known for its aromatic and flavorful properties, but it also packs some powerful health benefits. The active compound in vanilla is vanillin. Vanillin is a polyphenol with strong antioxidant activity. Vanilla is also used believed to have natural antidepressant properties which could help to elevate mood. Traditionally, Vanilla has been hailed as an aphrodisiac, though whether it makes men hungry for intimacy or just plain hungry is up for debate. The primary reason it’s included in Choc O Lot Ahh… is for its ability to stimulate the brain, causing the release of endorphins, or “feel goods.” The thermogenic properties of Cayenne are well-known and used in weight loss supplements to boost metabolic rate. Cayenne is a stong bactericide, encouraging healing while deflecting infection. It can also kill free radicals, which cause aging and even cancer. Cayenne slows the assimilation of fat in the intestines. It is considered a natural stimulant and stimulates circulation. It has been shown to stabilize blood pressure and lower cholesterol. It is loaded with Vitamin A, which is vital for sharp eyesight and smooth skin. It is also full of Vitamin C, which has healing and immunity boosting properties. act as a catalyst to boost both the effect and the assimilation of the other ingredients. Natural, safe, and powerful, this blend ensures that a little will go a long way. ​You won’t find alcohol, sugar, artificial sweeteners or preservatives of any kind; also no fillers and no dyes. Only the finest natural ingredients; no shortcuts, no compromises.